How did we even get this concept of vitamins? How much of each vitamin do we need to be healthy? Signing off and toasting: To more science-based health documentaries like Vitamania! 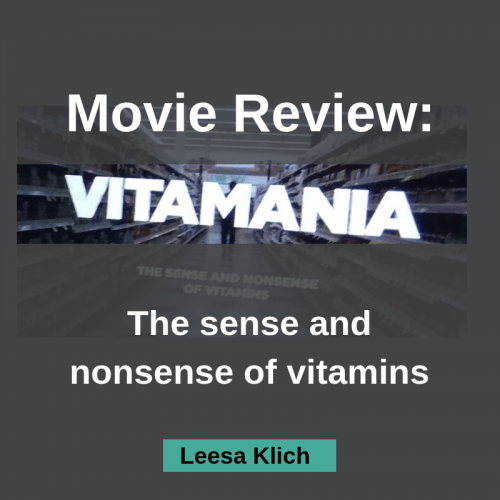 As you may get from the aptly-named movie, “Vitamania: the sense and nonsense of vitamins” explores our knowledge of, and infatuation with, vitamins. The movie dives into a few people’s personal, surprising, and emotional stories ranging from severe vitamin deficiency to severe vitamin toxicity. One key lesson is that we shouldn’t assume that because small amounts of vitamins are critical for life, more is always better. The movie also looks at getting vitamins from food versus supplements, which reinforces the fact that you can’t supplement yourself into health. Before diving into the movie review, please note that this movie is literally about vitamins: those 13 “vital amines” named A, B1, B2, B3, B5, B6, B7, B9, B12 C, D, E, and K. When referring to vitamin supplements in this movie, we’re not talking about herbs, enzymes, probiotics or other supplements – but quite literally vitamins in foods and vitamin supplements. WARNING – Just hours after watching this movie I found myself in Costco with a very strong desire for a non-fortified baguette! This movie inspired me to buy lots of nutritious foods (which I always do), but also a baguette (which I rarely do). This is my personal n=1 anecdotal side effect of watching this movie. P.S. You can download an HD copy of the movie for less than the price of one movie ticket. You can “rent” it online for even less. This is a great deal, and I’m not an affiliate! The idea that there are essential nutrients beyond protein, fat, carbs, and water is a fairly new concept! It wasn’t until just over 100 years ago, in 1911, that we even thought there could be disease from something other than what we were exposed to – germs, toxins, (humours, beliefs, actions, etc.). It’s more that disease was done to us by an external force. As though the body would naturally be healthy unless it came into contact with something negative. At that time it was groundbreaking to consider that disease could happen from something that was lacking – something that we needed even in tiny microscopic amounts. That’s right, medical knowledge at the time didn’t even fathom the idea of preventing disease. For centuries, millions of people suffered and died from deficiency diseases like beriberi, rickets, pellagra, and scurvy before research identified those microscopic compounds (vitamins) that we all need for a healthy life. We’ve all heard of limes being brought onto British naval ships for scurvy, right? This didn’t happen until decades after Dr. James Lind did the very first clinical trial in history. Scurvy was so widespread that it’s thought from the late 1400s-1800s 2 million sailors died from it. In 1747 Lind took 12 sailors suffering from scurvy, divided them into pairs, and gave each pair a different “treatment” to try – sea water, cider, citrus fruit, etc. It was those who received the citrus fruit that had a remarkable recovery. At the same time, however, those who received cider also had a moderate recovery. It seems even he didn’t realize the power of what he discovered since he buried this finding half-way through his 400 page book. Some 48 years later in 1895 (one year after Dr. Lind’s death) another doctor convinced the British navy to supply lemon juice to sailors because they had very few fresh fruits and vegetables on board their ships, and none in their daily rations. As a Canadian – the power of the British navy in the 1800s shaped my home and native land! Over 100 years later in 1911 Polish chemist Dr. Kasimir Funk did a similar experiment as Dr. Lind, but with pigeons. Dr. Funk took groups of pigeons and fed them different foods – sugar, starch, white rice, or brown rice. He discovered that the only ones that thrived were those that ate brown rice. Funk wanted to identify the mystery substance in brown rice and coined the term “vital (life) amine (a compound containing a nitrogen)”. NOTE: Not all vitamins contain the nitrogen, regardless, they are all labelled “vitamins”. Fast forward to today. Worldwide, the supplement industry is worth $100 billion/year. There are 85,000 products in the US alone. People who are already healthier (and wealthier) than the people who don’t take them! Vitamins are often thought of as being “miraculous” and “safe”, but that’s not always the case. In fact, in most countries (unlike here in Canada) there are little, if any, requirements for manufacturers to prove safety or efficacy. For one thing, it depends on the vitamin. Fat soluble vitamins like A, D, E, & K can build up in our fatty tissue. Excesses are not easily excreted in urine like the water-soluble Bs and C.
At 17:24 in the movie there is a great scene! It’s a visual representation of the amount of each vitamin we need in one day. It puts the quantities of these tiny micronutrients into perspective. My educated guess is that these amounts are probably based on the Recommended Daily Allowances in the dietary reference intakes. These amounts are the goal amounts for each vitamin that would be “sufficient” for 97% of healthy people. The RDA is the average daily dietary intake level that is sufficient to meet the nutrient requirement of nearly all (97 to 98 percent) healthy individuals in a particular life-stage and gender group. The RDA is the goal for usual intake by an individual. 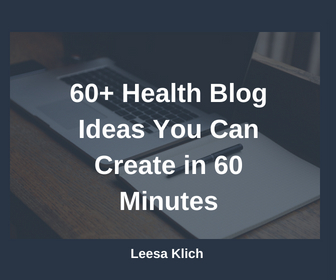 If you are not an average healthy person, your RDA may vary (but neither the movie nor this blog post are medical advice). These RDA levels are tweaked from time to time as new research findings unfold. After that (highly recommended) visual of the amounts of each vitamin we “need”, there was a plate of all of the food we’d need to get all those levels of vitamins. I LOVE THAT PLATE OF FOOD! My solution for getting your nutrients (as a nutritionist) aligns exactly with what this movie recommended – eat a variety of whole, unprocessed, nutritious foods! Honestly, the plate was beautiful! Whole fruits & veggies, whole grain rice, salmon steak, and yogurt. It really was inspiring and made it seem so achievable to eat the foods on that one large colourful plate of food in smaller meals throughout a day. I agree that it’s a very reasonable goal to get all of your nutrients from food, and not supplements. I also really appreciate the stories of people in the developed world (not the developing world) who suffered serious vitamin deficiencies. There was a person blinded by vitamin A deficiency, someone who needed a wheelchair due to folate deficiency in utero, and someone in the US with scurvy. Severe nutrition deficiencies happen. Today. In developed countries. In addition to these cases of serious deficiency, I would like to add that there are a lot of people who simply don’t get enough nutrients in their diets. One thing this movie did was help me take a step back and look at a few things. Not just how I feed myself and my family (BTW: Friday is pizza/beer night at the Klich residence! ), but how I’m actually able to do so. For one thing, I am pretty knowledgeable about nutrition, having studied it for years at both university and a private school. This allows me to be healthy, and health-conscious just because of what I know. But, there’s more to it than knowledge. There’s ability. Both financial and from a skills/equipment perspective. I am fortunate enough to be able to afford to shop at Costco and other grocery stores several times per week. I can afford to buy foods in bulk – even perishable foods which sometimes go to waste, even in my house. I am fortunate that I have some skills and equipment in the kitchen to make many foods from scratch and not rely on mostly pre-made processed foods. The movie covers a lot more. Derek interviews many experts including the author of the book Vitamania, people who’ve personally suffered from severe nutrient deficiencies and toxicities, researchers, nutritional epidemiologists, professors, museum curators, etc. I was particularly interested in the areas of toxic effects of too high levels of vitamins. And how, the range between “enough” and “too much” is often quite small. I’d also like to give a “shout out” to the section where he goes over how vitamins are themselves created, and then how they are manufactured into supplements for consumers. These are two separate processes and often are done by different companies, not all of which have great track records for producing safe and effective products. All in all, I highly recommend this documentary whether you like health documentaries or science – this is a rare case that skillfully includes both! Here’s the link to download an HD copy of the movie for less than the price of one movie ticket. You can “rent” it online for even less. This is a great deal, and I’m not an affiliate! Have you seen this documentary Vitamania? What did you think? Thanks for this info. I’m in the middle of watching it, and it’s very informative.